Fuel Efficient Fun – Is It Possible? Even though gas prices are down, the various forms of the Toyota Prius remain as popular as ever for the fuel misers and environmentally minded. But what fun is that? The terms "sporty" and "fun to drive" are never used to describe the Prius, and for good reason. It may get 50mpg, but you won't enjoy doing it. Can you have your fuel efficient cake and eat it, too? If I was going to get a highly fuel efficient car, I'd like to get my hands on a 1988-1991 Honda CRX HF. It, too, can achieve 50mpg, but without all of the bloated electronic crud of the Prius. Sure, it has no back seats, but from a practical perspective neither does my BRZ, and the CRX has a whole lot more cargo capacity due to its huge hatch area. Its simplicity also keeps it from destroying the planet in other ways. Sure, it doesn't have air bags, or stability control, or traction control, or ABS, or navigation, or Bluetooth integration, or… well, much of anything besides four wheels and a seat. But the CRX is one of the most fun front wheel drive cars I've ever driven, whether it's an HF or an Si. In my mind, it was the perfect fun to drive economy car. Unfortunately, there are two major problems with finding a CRX HF now. Due to being lighter than other CRX models, they were commonly chosen for more powerful engine swaps. These made them particularly fast, but they lost their fuel economy in the process, defeating the purpose of this exercise. Frequently such swaps also included ginormous wheels, extreme lowering kits, massive subwoofers, clear lights whether they were supposed to be clear or not, and wings more appropriate for Manfred von Richthofen's Fokker Dr.1 Triplane than any road vehicle. The other problem is that rust has caused many of the remaining unmolested CRXs to crumble and return to the Earth. So is the economy minded enthusiast doomed to life in a Prius C and pretending that it's remotely sporty due to its small size? There are some good sporty subcompact options out there, not the least of which is the Ford Fiesta ST. But with mileage of 26 city / 35 highway and a preference for premium fuel, while it's no guzzler, it's no fuel sipper either. It seems that it's still necessary to choose between either fuel economy or a fun to drive car. There's another little known Fiesta with an EcoBoost motor – the Fiesta SFE. This option is buried deep in the Build & Price checklists on Ford's web site. You must select the SE model, the 5-speed manual transmission, and Equipment Group 200A for the option to even appear in the Exterior Packages section, where it's called the SE EcoBoost Fuel Economy Package. This $995 option replaces the standard 1.6 liter four cylinder engine with a 1.0 liter three cylinder EcoBoost motor. I've owned motorcycles with bigger engines than this. But don't let the small displacement and missing cylinder fool you. Thanks to a turbo, this tiny engine makes 123hp. That's three more horses than the standard four cylinder. But where this small engine really shines, surprisingly, is in the torque department – 148 lb-ft, compared to 112 in the 1.6. Even better, all that torque is available at just 1400rpm. It likes to rev low, which is how the EPA rates it at 32/45mpg, though in the real world people routinely exceed 40mpg in mixed driving. But it also has enough power to get out of its own way when needed. So what? Other cars like the Honda Fit, the Nissan Versa, and the Chevy Spark aren't that far off in the gas mileage department, and without the added complexity of a turbo. But one reason the Fiesta ST is so fun to drive is that the basic Fiesta platform is excellent. It's a very popular rally car, and not just in highly modified WRC or Global Rallycross trim. Team O'Neil Rally School uses a fleet of Fiestas, and not the ST, either. And that gives the Fiesta SFE an edge over the competition for the eco-minded enthusiast. Of course, you do give some things up with the Fiesta SFE. Like the ST, it is only available with a manual transmission. While this shouldn't bother enthusiasts, it is likely to turn off many economy minded buyers. Gone are the fog lights, satellite radio, and navigation, with only the most basic SYNC stereo available (though some may consider the lack of MyFordTouch to be a blessing). The alloy wheels give way to steel 15" wheels with hub caps. But at least the Comfort Package is still available, which I'd personally get for the heated seats and heated mirrors, and includes automatic climate control. The Fiesta SFE, equipped as I've described, is available for $17,705 as a hatchback (the one I'd get), or $17,305 as a sedan. Compare that to $19,540 for the Prius C One, the cheapest Prius C you can get, and that doesn't include a 60/40 split rear seat or even cruise control. Bump the price to $20,340 for a Prius C Two that's equipped comparably to a Fiesta SFE. Sure, the Prius C still has the Fiesta SFE beat for gas mileage, 50mpg vs. 40. But how long will it take you to make back the $3,635 price difference in fuel savings? According to fueleconomy.gov, the Fiesta SFE's annual fuel cost is $850, compared to $600 for the Prius C, a difference of $250 per year. That means it will take more than 14 years to break even on fuel savings in a Prius C Two. Will anyone actually keep a Prius C for 14 years? More importantly, will a Prius C last for 14 years without major work like a battery replacement, an extra hybrid expense that would effectively push the break-even point even farther out? In the real world, the non-hybrid Fiesta SFE seems like the more economical choice. Other than the extra fuel, what do you do with the money you saved on getting the Fiesta SFE instead of the Prius C? Make it even more fun, of course. Its small engine and economical, high fifth gear means that you have to downshift a lot. The shifter isn't the best, but Ford Racing offers a short shifter upgrade for $200. While you're there, pick up their Fiesta Handling Pack for $300. Try getting that from your Toyota dealer for your Prius C.
You can get a more serious suspension if you plan to autocross or track the car, but if you were going to do that you would've just bought a Fiesta ST. But that doesn't mean you can't buy a set of used Fiesta ST alloys for around $400 and put some better performing rubber on them. Some Michelin Pilot Super Sports will run you $664. Sure, you'll give up a few miles per gallon by doing this, which means you might actually drop below 40mpg on occasion. Whoop de do. There's one last thing you have to consider, though. 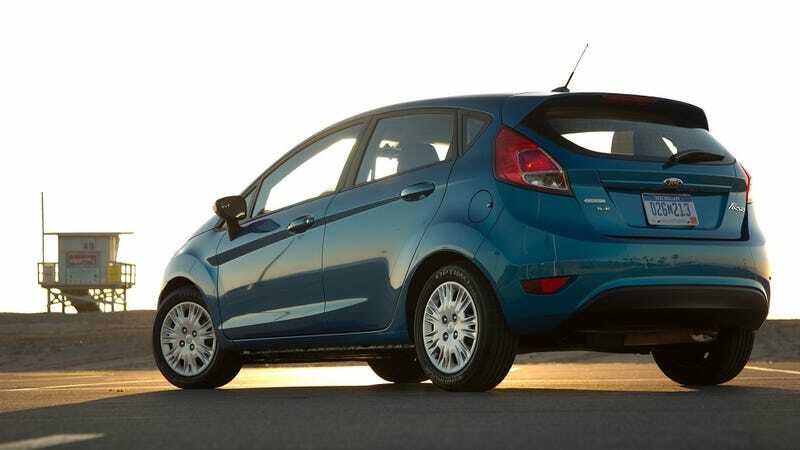 Add up the total for this Fiesta SFE and the performance parts, and the price tag comes to $19,269. For a few dollars more, you can get yourself into the most basic Fiesta ST for $20,945. Is it worth it to you to spend that much on a sporty fuel sipper when you can go whole hog for around $1,700 more? Maybe, yes, it just might be worth it. A lightly modified, corner carving Fiesta SFE might just be the epitome of the fun of driving a slow car fast. You can have fun extracting every last pony out of all three cylinders, carrying that speed through the curves with an excellent chassis and Ford Racing tuned suspension, and feeling like you're going really fast, but without actually achieving "go directly to jail" speeds. I find that far more entertaining than driving the same road at the same speed in a fast car that feels the same way I do when I haven't had my morning coffee, unless it's at full speed on a track.